SSB Recruitment 2018, Visakhapatnam has published advt. 294/RC/SSB/Adv./2017/5571 for 335 Inspector, Head Constable, Subedar vacancies in SSB. 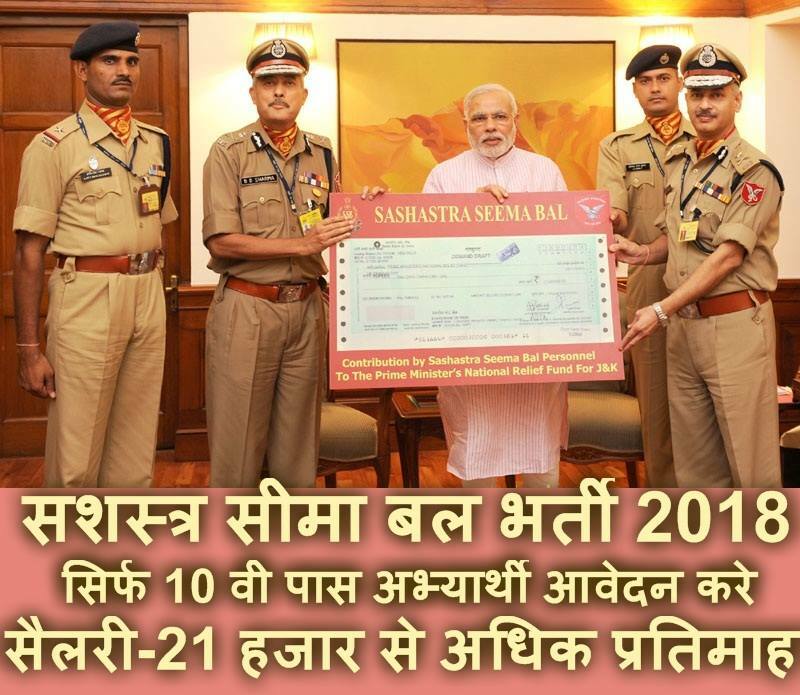 Applicants who having 10th, 12th / Bachelor’s Degree in Civil Engineering / Diploma / Master's degree, Officers of the Central Government or the State Government or Central Armed Police Forces including Sashastra Seema Bal or Central or State Public Works Departments or Military Engineering Services or General Reserve Engineering Force. Or its equivalent qualification from a recognized Board / University. Can apply through the prescribed format before 60 Days. Applicants may send application form to Sashastra Seema Bal office. Applicants form is available on Sashastra Seema Bal website. www.ssb.nic.in. Education qualification: 10th, 12th / Bachelor’s Degree in Civil Engineering / Diploma / Master's degree, Officers of the Central Government or the State Government or Central Armed Police Forces including Sashastra Seema Bal or Central or State Public Works Departments or Military Engineering Services or General Reserve Engineering Force. Or its equivalent qualification from a recognized Board / University. Age Limit: Candidates Maximum age should not exceed 56 Years. How to apply: Eligible applicant require to send their applications in the prescribed format along through official website www.ssb.nic.in. After filling the application form, candidate must send hard copy of application along with relevant testimonials (Mentioned in Detailed Advertisement) to the following Address before or on Within 60 Days. Write on the envelope “application for the post of Inspector, Head Constable, Subedar”. Address: Composite Hospital, SSB, Gorakhpur, UP & Assam. Education qualification: Medical Qualification / Post Graduation Degree / Diploma or its equivalent qualification from a recognized Board / University. Selection: Interview. All Eligible candidates Can Should Attend Walking Interview On / From 27.12. & 28.12.2017. Age Limit: Candidates Maximum age should not exceed 67 Years. 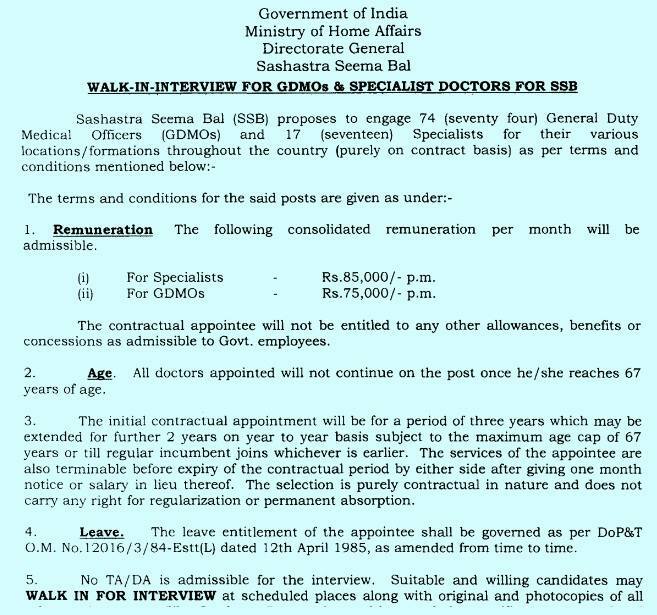 (i) For Specialists- Rs.85, 000 /- p.m.
(ii) For GDMOs- Rs.75, 000 /- p.m.
How to apply: Eligible applicant require to send their applications All Eligible candidates Can Should Attend Walking Interview On / From 27.12. & 28.12.2017. 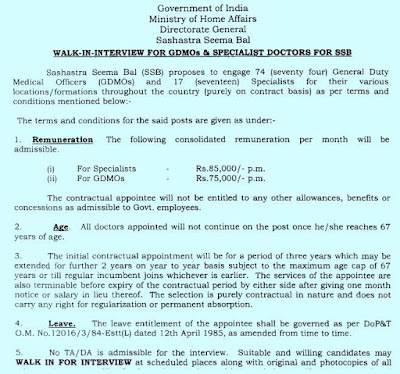 Write on the envelope “application for the post of General Duty Medical Officers, Specialists”. Application should be Reach to: - Composite Hospital, SSB, Gorakhpur, and UP & Assam.